In the 1960s, the political climate in America was beginning to change. The country previously had been steeped in racism against African Americans and the majority of the nation was considered to be a segregated country. There were separate schools for races, separate water fountains there were restaurants that said “whites only” and this was considered the norm, especially in the south. Yet in 1954, a major shift happened and the first major landmark in the road to Civil Rights was paved. The Supreme Court, headed by Earl Warren, voted unanimously that it was unconstitutional and unjust to have laws forcing segregation between whites and blacks. As the highest level of law in the land, they ordered for the immediate desegregation of public schools in all states. This was no small task and it was no small action. Previously, states had a certain degree of control over their ability to enforce discrimination laws. They maintained that they had the sovereign right, as free states, to enforce these laws and as such, discrimination and segregation ran rampant. Those laws were known as Jim Crow Laws and they reigned supreme until the legal case known as Brown vs. Board of Education came before the Supreme Court. It was from there, in 1954, that it was made known that legally enforced segregation of schools would come to an end. But ruling on a law and enforcing a law are two very different things. Just because the Federal Government said that desegregation was over didn’t meant that it was truly over. In fact, this ruling was just the beginning of a long process of schools being forced to desegregate. Our story today takes us to New Orleans, in 1960, where desegregation was something the public was desperate to avoid. There were a lot of attempts, on a city level, to block desegregation of the public schools in New Orleans, but those attempts failed. It was clear that they would be forced to allow African-Americans to attend their schools. On November 14th, 1960, two schools were desegregated. Students were allowed to transfer into those schools. Of course, the schools themselves weren’t interested in receiving transfers and instead developed a test that needed to be passed in order to transfer. This test, of course, would be extremely difficult and thus would hopefully prevent any black children from being able to transfer. One of the two schools, William Frantz Elementary School, would soon receive its first black student. A young girl by the name of Ruby Bridges. Ruby, a little 6-year-old girl, had received word that she would be eligible to take the test for transferring. The school was closer than the segregated school she had been going to earlier and in her innocence, she wanted to go. She wasn’t fully aware of the radical racism that was surrounding these schools and instead thought it would be a good idea to go to a school only five blocks from her house. Her father wasn’t a fan of this plan and tried to dissuade his daughter, but Ruby’s mother wanted her daughter to receive a better education. A white school has more funding, she reasoned, so Ruby would receive a much better education. Not only that, Ruby’s mother maintained, this would help in the entire desegregation movement. After much argument and discussion, Ruby’s father finally relented and they allowed their little girl to take the test. Soon Ruby discovered that she had been the only child out of six to pass the test. She was officially enrolled into William Frantz Elementary School. To a little girl, it was a happy occasion, after all she’d get to go to a new school. She was a little too young to fully understand the situation that was happening. To the rest of the world, she was the first African-American to go to a desegregated school in Louisiana. This was a big ordeal. Ruby arrived to school, eager and excited. She could see people all around the school, shouting and throwing things. It was a celebration! After all, she was in New Orleans and this must have been Mardi Gras, right? In her innocence, that was what she believed, but the unfortunate truth was that those people surrounding the school and shouting were protestors. A large band of whites had boycotted the school and they had pulled all of their children out of the school for the day, as a way to protest Ruby’s entry. Ruby’s car pulled up to the steps of the school and four men emerged with her. They were Federal Marshalls. Their job was to ensure that the school was desegregated, by any means possible, and with the danger of violence and savagery from the protestors, they were also there to protect Ruby. These Marshalls escorted her through the picket line into the school, where Ruby had the pleasure of sitting around and doing nothing for the entire day because every last student had left the school for the day. School had effectively been cancelled. The protestors had no intentions of going away either. On Ruby’s second day, sure enough, they were there shouting and hurling insults at the little girl. Ruby began to realize that things weren’t as sunny as she had initially hoped. As she was escorted for her second day of school by the Federal Marshalls a woman shouted out from the crowd “I’m going to poison you for coming here!” This death threat was taken seriously and the Marshalls instructed poor Ruby to never eat anything from the school and instead bring her own lunch with her. The second day of school seemed just as uneventful as the first. It looked like there wasn’t going to be any classes for Ruby because no one seemed like they wanted to teach the girl. That is, until Barbara Henry stepped in. Barbara was from Boston and had been raised in an all-girls school that was desegregated. It was in that school that she had learned the value of all life, regardless of their skin color. She had landed in the New Orleans public school, unaware that it would lead her to the opportunity of a lifetime. She saw little Ruby as an adorable, smart girl who needed someone to learn from. So, Barbara agreed to teach her. The two bonded quickly and Ruby spent her time learning everything that she could from Mrs. Henry, despite the fact that they were the only two people in the classroom. No one student was with Ruby because none of them were willing to be seen with her. The two set out on a long journey of education together with Mrs. Henry refusing to compromise the quality of education for the girl. So, they did everything together. Barbara was the gym teacher, the music teacher, the history and English teacher. They sang together, played together, read together. Barbara didn’t treat the classroom as if it were empty and instead kept all of the formalities of it being a full classroom. Ruby continued to go to school, regardless of the way people around he treated her. The racism was fully understood now and while she was afraid on the inside, her heart resolved to keep herself strong externally. It was said that she didn’t whimper, cry or ran away despite the crowd screaming at her and hurling insults. Even when she received death threats and these adults displayed the full ugliness of racism to a little girl, she stayed strong. When afraid, she would pray. She wouldn’t be discouraged. The time in school was a lonely time for little Ruby. She had Mrs. Henry to keep her company, but she wasn’t even allowed to join the cafeteria or go out for recess. The two were bound to the inside of the classroom for quite some time. A few students were beginning to trickle back into the school, but they still wanted nothing to do with her. As her interactions with other students became rejected, she started to realize that it was because of the color of her skin. This cast a damper on her whole heart and soon she began to experience nightmares. She would waken frequently in the middle of the night and wouldn’t be able to go back to sleep. Pressure on her family was exerted as well. As backlash for sending their daughter to a formerly all-white school, Ruby’s father lost his job. Her grandparents were forced off of some land that they had been taking care of for several years. Even the grocery store they frequented made a point to keep them from shopping there. The ramifications for standing against society’s norm, the decision to fight back against racism had a cost and it wasn’t easy for everyone to stomach. But they continued on. Soon Ruby found herself in the company of a psychologist who assisted her by listening and talking with her. On occasion this psychologist would bring his wife to their sessions to help the girl continue to develop healthily. Soon things began to take a turn for Ruby. Her family found themselves supported by their neighbors and friends. People began to come alongside Ruby as she went to school, they would be right behind the Marshalls helping her have a sense of safety. Some friends gave Ruby’s dad a job. The protests lasted almost a year. Every day there were people out there, screaming and shouting at Ruby. Sometimes they would intimidate her, but in those times of fear she would simply pray. She would pray not just for strength but she would even pray for those who were mean to her. She continued each and every day, never missing a single day of school. Mrs. Henry also didn’t miss school either and the two spent each day together. 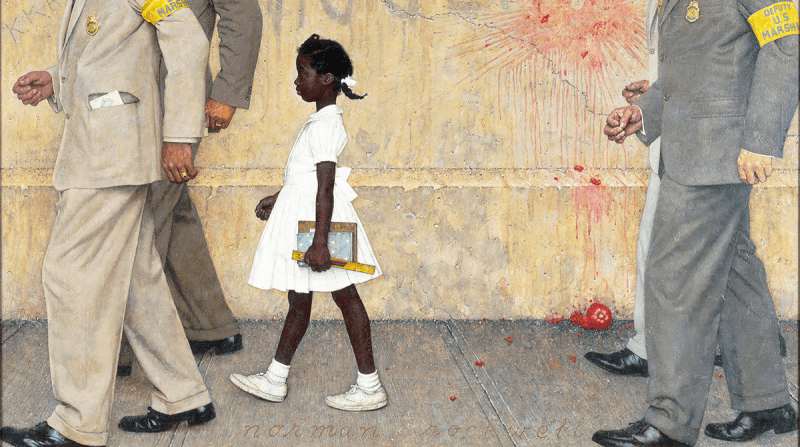 Through courage, determination and a refusal to let the racism around her drag her down, Ruby Bridges passed her first year of elementary school. The second year rolled around and she arrived to a school that had no protestors. Children were instead seen going into class. Mrs. Henry’s contract was not renewed with the school, and so she had departed. Ruby found herself inside a second-grade classroom full of other children. It was almost like the protests last year had not happened. Things would be normal for this little girl and she would go on all through the school system and graduate with her high school diploma. Ruby’s story isn’t loud and explosive. There were no big speeches given, no rallies held in her honor. She didn’t command the attention of the national media and she certainly didn’t move hearts and minds across America to change. But in truth, that is not how segregation was defeated. Segregation in America was a war that was won by small victories. All it took was for one little girl to stand up and do something. Across the country, there are hundreds of stories of people who decided to do something about where they were. Sometimes those stories, like Rosa Parks, echo across the media. Sometimes those stories, like little Ruby’s don’t echo nearly as loud. But in the end, we see the truth, that no major social change happens in one swift movement. There is no definitive singular story that ended segregation, just as there will be no singular event that will end racism. Instead, the battle is won little by little, one person at a time. The tide of progress might not seem like it is moving quickly for some, but with people like Ruby, a little girl who’s first major contribution to the civil rights movement was just to go to a school where people would cast dispersion and hatred upon her, there will be progress. The world will change with each and every small victory.